Our speaker November 9, 2017 is Rear Adm. Ronald Boxall. He is a native of Holland Patent, New York. He attended The Pennsylvania State University, earning a Bachelor of Science and was commissioned in 1984. He also attended the Naval Postgraduate School in Monterey, California, where he earned a Master of Science in Information Systems and later attended the Naval War College in Newport, Rhode Island, earning a Master of Arts in National Security and Strategic Studies. 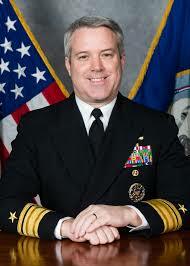 Boxall’s sea duty assignments include: commander, Carrier Strike Group 3 embarked in USS John C. Stennis (CVN 74); command of USS Lake Erie (CG 70) and USS Carney DDG 64); executive officer of USS Hue City (CG 66); combat systems officer in USS Simpson (FFG 56) and USS Ramage (DDG 61); and division officer in USS Merrill (DD 976) and USS Kinkaid (DD 965). During his seagoing career, he has made numerous deployments around the world from the Western Pacific, Atlantic and Indian Oceans to the Baltic, Mediterranean and Caribbean Seas as well as combat operations in the Arabian Gulf and counter-narcotics operations off South America. A former Pacific Fleet Shiphandler of the Year, he was also fortunate to have been associated with four outstanding Battle “E” winning crews. Ashore he served in numerous joint and staff billets to include: deputy director for Joint Strategic Planning (J-5) and deputy and chief of the Joint Staff Quadrennial Defense Review Office (J-8) on the Joint Staff, where he was selected as Action Officer of the Year; deputy director for Surface Warfare (N96B), executive assistant to the deputy chief of naval operations for Integration of Capabilities and Resources (N8), and executive assistant to the director of Navy Warfare Integration (N8F) on the Office of the Chief of Naval Operations (OPNAV) staff; and placement officer and deputy Surface Officer Distribution Division (PERS-41B) at Naval Personnel Command.